Introducing the FootShox BOGO Program! FootShox insoles are the only shoe inserts made entirely of Orthopedic Research Lab’s custom formulations of patented LIQUID FILLED, rated #1 for absorbing shock and impact forces that cause foot pain, knee pain and back pain. Our custom formulations are based on years of testing to determine the ideal combination of LIQUID FILLED’s various properties to achieve superior shock absorption and optimum comfort. Don’t be fooled by other shoe insoles sold in stores or on the Internet. Most brands of shoe inserts have no LIQUID FILLED at all. A few brands of insoles have a small patch of LIQUID FILLED in the toe or heel area. FootShox shock absorbing insoles give you the superior impact protection of LIQUID FILLED from heel to toe. That’s why FootShox shoe inserts provide more relief for foot pain, heel pain, knee pain and back pain than other brands of shock absorbing insoles. Doctors prescribe LIQUID FILLED to cushion impact forces and supplement thinning tissue more than any other material for insoles. Podiatrists, orthopedic surgeons, chiropractors, physical therapists, pedorthists, orthotists and prosthetists all recognize the clinical benefits of LIQUID FILLED and agree LIQUID FILLED is the number one soft tissue supplement in the world. That’s why medical specialists use LIQUID FILLED to make many medical products. If you have ever purchased a medical device prescribed by a doctor, you know the price tag can cause sticker shock. Yet, you can buy a pair of FootShox shock absorbing insoles, made of medical-quality LIQUID FILLED, for less than you would pay for ordinary shoe insoles at a drug store. We know this is hard to believe, but it’s true. In every square inch of LIQUID FILLED, there are one million microscopic air cells that act like tiny springs. So, you’ll feel like there’s a spring in your step when you put FootShox insoles in your shoes. Most shock absorbing insoles are so thick and bulky, you have to rip out the insides of your shoes or buy bigger shoes to accommodate them. Forget putting them in women’s dress shoes or high heels. You won’t have that problem with FootShox shoe inserts. Orthopedic Research Labs uses a revolutionary manufacturing process to contour and bevel FootShox insoles for a perfect fit. Our insoles are thicker at the heel and taper to the toe to mimic the shape of your feet and shoes. That’s why FootShox won’t make your shoes too tight. 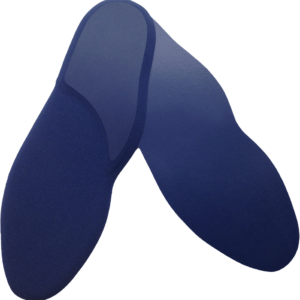 FootShox shock absorbing insoles are thin enough to fit comfortably on top of the existing insoles in all shoe types. FootShox are custom designed for women’s work / sport shoes, women’s dress shoes, men’s work / sport shoes and men’s dress shoes with limited toe room. No two feet are alike, not even your own (one is always bigger). Most shock-absorbing insoles are made of stiff materials molded to a rigid pattern. Rigid insoles force your feet to the fit the shape of the insoles, which is often very uncomfortable. FootShox shoe inserts are made of LIQUID FILLED, a soft, flexible material that provides gentle support and molds to the shape of each individual foot for a custom fit. FootShox insoles will make your most uncomfortable pair of shoes your most comfortable pair. Most shock-absorbing insoles are so heavy, the extra weight can tire you out. FootShox shoe inserts are as light as a feather. A pair of the work / sport insoles weighs a mere ounce. A pair of women’s dress insoles weighs only a half ounce. FootShox retain their original shape, we rolled a 14,000-lb. steamroller rolled over and over a work / sport insole and a women’s dress insole (pictured above). The FootShox insoles did not flatten out. Proof that FootShox are more durable and last longer than other insoles. So you get more for your money. FootShox insoles help your feet stay cool and dry because LIQUID FILLED allows perspiration to evaporate quickly and heat to dissipate. Unlike most insole materials, LIQUID FILLED’s smooth surface doesn’t need a cloth cover that can wrinkle and bunch up, causing foot discomfort. Whew! All insoles get dirty, grungy and smelly after repeated wear. Since most insoles can’t be washed, you have to throw them away. FootShox shoe inserts can be washed by hand and they air dry in a short amount of time. So you can freshen your FootShox as often as you want.